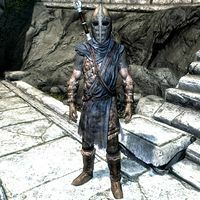 Stormcloak Soldiers can be seen throughout Skyrim in Stormcloak camps, patrolling roads and occupying forts. They are the main troops of the rebellion and can also serve as guards in controlled regions. If you have yet to take a side in the civil war, they will recommend that you join the rebellion in Windhelm. However, if you have joined the Imperial Legion, they will demand that you move along, threaten you, and if you linger for long enough, they will attack. They may carry any iron or steel weapon, and wear Stormcloak armor. 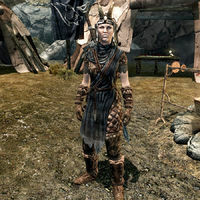 A Stormcloak soldier can also be seen being escorted by three Imperial soldiers as a prisoner. If you talk to him while his hands are bound (whether the Imperial soldiers are still alive or not) he will offer you three choices: do nothing, let him go, or give him something (he will equip any weapons you give him, but not armor). If you let him go or give him something, his captors will try to kill him (if they are still alive). He will likely be killed if you don't help, due to having no armor and facing three well armed soldiers (they will also be hostile to you). If he is alive and unbound, and the Imperial soldiers are dead, he will set off for Windhelm. If he makes it there, he will disappear upon using the main gate. This page was last modified on 14 February 2016, at 15:59.